Thanks for having me here today, Karen. I currently work for a large leasing company titling and registering cars across the country and in neighboring Canada. Before that I worked for long term care facilities in the business office. And then had about a year where I tried to piece together full time work from a variety of part time jobs while I started my own company. I’ve been a mystery shopper, a professional organizer, a grant writer, and a waitress. And for the first twenty years of my career, I worked for the State of Idaho in various social service agencies. All great experience for the life of a writer. I’ve got one son who lives in Seattle doing Seattle type computer work. Which means, I have no clue what he does. I’m married to my soul mate, who I found after kissing a lot of toads, including one I married which I call my starter marriage. I fell for the Cowboy, my current hubby, the first night I met him. We have two fur babies and live in a small, historic town on the Mississippi River. Hobbies, right now include surviving a remodel, learning to love working out and living a healthy lifestyle, and cooking. These all change when I actually have time to craft or visit museums or bike ride. When I started my divorce, people kept asking me what I liked to do. I’d never been asked that before, or it had been a long time, so I started taking fiction writing courses over at the college. Five years later, I was still going to write, someday. I went for a routine mammogram and found out I had breast cancer. Then I knew that someday had to be today. I sold two essays that year. Then started writing a book. Then I wrote and sold a short story to the confessions market. I loved writing for the market. “I fell in Love with a Carney”, was my first story. At the same time, I started meeting other writers who gave me excellent advice including finish the darn book. The first book I started was a thriller. My shorts I played with during class were woman’s fiction. Too sad to be romance. The first book I finished was a romance. And I love writing happy ever afters. I just also like writing murder mysteries. So right now, I do both. The beginning of a story when anything is possible. Good will triumph over evil, the girl will get the guy, and the words flow out of my fingers without effort. Camel time. Hump day. The dreaded middle. I always worry that I’m being dumb, or the story is faltering, or I should just start over with a brand, new idea that won’t be this hard to write. Then I push through it, outlining in bullet points to the end. After I let the story simmer for a while, I realize, that those chapters are quite lovely. Everywhere. The Bull Rider’s Brother, my debut from 2012, started from a memory of going to a small town rodeo and watching the parade snake through town. An unpublished (so far) manuscript started from a visit the Cowboy and I took to a big cat sanctuary in southern Missouri. South Cove, my fictional central California coast tourist town where Guidebook to Murder (e-Kensington, April 2014) is set, started from a picture of a very old, run down house on my trip to see my sister. My voice. I see things differently than others. My heroines are relatable without being too stupid to live. My heroes strong, yet vulnerable on the inside. And like me, my characters make mistakes. Hopefully, we learn from them. I’m big into woman’s fiction now, especially if the book surrounds food. I’m devouring Barbara O’Neal’s books. But I’m also a big fan of Lisa Gardner and Heather Graham. After Return of the Fae, my current release, at the present, I won’t have a new release until April 2014 when Guidebook to Murder, the first of The Tourist Trap Mystery series will release. I love building this small California town and getting to know the inhabitants. Jill Gardner traded in her big city condo, high stress job, and low potential boyfriend to run South Cove’s Chamber of Business chapter. South Cove’s a tourist town steeped in California history, known for artisan craft houses and keeping the secrets of its residents. She’d be living the dream, but when one friend winds up dead and another disappears, Jill finds the big city isn’t the only place where murderers hide. And she’s up next on the killer’s to do list. History and tourist lore bring a unique twist to life in this coastal California town. South Cove, just like other tourist towns, has one primary goal—keep up the image. Even when that means murder. 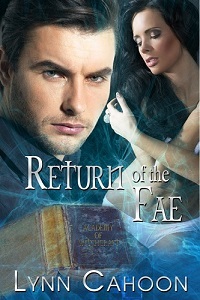 BE SURE TO COME BACK to read more about LYNN and her novel, RETURN OF THE FAE, on Wednesday’s Karen’s Killer Book Bench!! Happy Reading! Hi, Lynn. I like the way you describe your characters. They certainly do sound easy to relate to. I love a strong hero with a vulnerable side. Congrats on Return of the Fae, and Guidebook to Murder sounds awesome. I love mysteries! Great interview, Lynn! I’m with you on having a hard time with the middle. My insecurities batter me in the middles! Good for you for ignoring them and battling on because now look at your successes! Hi Lynn, I’d never thought about an author have a favorite part of a book, but I do love your description of yours. It makes perfect sense. I love that I’ve finally found someone who has had more jobs than me. Lots of material in those jobs, right? I prefer beginnings too. I have some control over the beginnings, then my characters take over, and gold only knows where we go. RT – I love the beginning. Anything is possible, I have such high hopes. And it has that new car – new boyfriend smell. Gemma, I love learning new things. So having different jobs makes me happy. And you’re right, it’s great book fodder. Tera, the middle is just hard. It’s work. And you don’t know if everything will be okay in the end. Kind of like life. MQ – I love my bright and shiny’s. They take me away. Sometimes a story comes out, sometimes not, but it’s always entertaining.